“On Front Line of Legalization, Pot Has Become Big Business,” front page story Buffalo News, August 31, 2014. Senator Liz Krueger and Assemblywoman Crystal Peoples-Stokes “Marijuana Regulation and Taxation Act” to legalize marijuana for personal adult use in New York. Peoples-Stokes’ press release is here. 2014 Quinnipiac poll -- nearly 90% of New Yorkers support medical marijuana and 57% (83% of 18 to 29 year olds) favor legalizing small amounts of marijuana for personal use. Plus nearly 50% or 9,000,000 New Yorkers have tried marijuana, flaunting drug laws they don’t respect. 2013 Gallup Poll – 58% of Americans Favor Legalization! 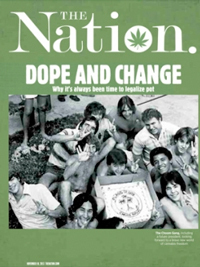 To order a copy of the November 18, 2013, special issue on marijuana of the Nation Magazine, call 212-209-5400. Walter Simpson is a long time environmental educator and activist and professional energy conservationist. Walter and his wife Nan and family live in a super-insulated passive solar home with solar electric and hot water systems in Amherst, New York. Walter’s interest in the legalization of marijuana stems from his sense of fairness and justice, a strong belief in freedom and personal choice, a desire to see taxpayer money spent wisely and not wastefully, and from personal experience which has shown him how destructive policing, prosecuting, and punishing marijuana use can be. In March 2013, of the 7,000 people who were imprisoned under the custody of the New York State Department of Corrections principally on drug offenses, 54% were African American and 29% were Latinos. Someone is arrested for a marijuana offense every 37 seconds. 89% of these are for marijuana possession – not for sale or manufacture. In the US, 850,000 people a year are arrested for a marijuana law violation, more than for all violent crimes combined! Marijuana is an enjoyable and relatively harmless drug. Marijuana is less harmful than tobacco and alcohol, both of which are legal. The criminalization of marijuana represents an unjustified intrusion of big government into our private lives while the legalization represents respect for freedom of choice and personal privacy. Punishing non-violent marijuana users, growers, or sellers serves no legitimate purpose and is inhumane and destructive. Legalization of marijuana would increase respect for police, district attorneys, judges, and the courts. Legalization would save taxpayers billions of dollars by eliminating needless police, court, and prison costs associated with the prosecution (and persecution) of marijuana users and producers. Legalization would also produce billions of dollars in new tax revenues while reinvigorating the economy by creating legal jobs producing and selling legal marijuana. Criminalization does not prevent children or adults from obtaining marijuana. Over 100 million Americans have tried and used marijuana including Bill Clinton, George W. Bush, Barack Obama, Clarence Thomas, Al and Tipper Gore, Newt Gingrich, John Kerry, Arnold Schwarzenegger, Sarah Palin, Howard Dean, George Pataki, and Michael Bloomberg. You could probably add to that list most rock musicians, Hollywood celebrities, many high school and college students, a majority of baby boomers like myself, and quite a few police officers and judges who now enforce laws against marijuana. A recent Rasmussen poll revealed that 43% of Americans say that marijuana should be legalized, and 65% predict it will be legal in ten years. Gallop polls show that support for marijuana legalization has grown from 25% in 1995 to 46% in 2010. And last month Californians almost voted to legalize of marijuana use by adults in the Golden State. California Proposition 19 failed by a 46 to 54 margin but the measure won the support of a greater percentage of voters than any previous state marijuana legalization referendum, received more votes than Meg Whitman’s $160 million campaign for Governor, and had union, civil rights, and law enforcement support. The measure might have easily won if greater financial backing had been found, more young adults had bothered to vote, and certain provisions were drafted differently. Significantly, just before Election Day, Governor Arnold Schwarzenegger took the wind out of Prop 19’s sails by enacting a state law that makes possession of up to an ounce of marijuana an “infraction” -- like a parking ticket -- rather than a “misdemeanor.” This is similar to New York law which makes possession of less than an ounce of marijuana punishable by up to a $100 fine for the first offense. So at least in progressive states like New York and California, marijuana possession penalties have been reduced. Decriminalization is good but legalization – which would also address production and sales -- would be better. Popular culture accepts marijuana and most people who have tried it will say privately that the prohibition against “weed,” “cannabis,” or “pot” is unjust, unwarranted, or downright silly. Yet, in 2009, 850,000 Americans were arrested on marijuana charges and 88% of those just for possession. Our treatment of marijuana doesn’t make sense but fortunately change is on the horizon. I tried marijuana when I went away to college in 1967. And I very much did inhale, initially so I could find out what the mystery was all about and later because I found marijuana to be very enjoyable with no adverse effects on my health or grades. Marijuana also produced intellectual joys. While smoking marijuana may have replaced sharp thinking with euphoria and a lot of silly conversation, if we were lucky, smoking a “joint” might also produce what felt like a religious experience -- a rush and merging with the world more powerful than most of us would ever experience after years of Zen meditation. Perhaps it was illusory but it was powerful and worth experiencing. While I smoked little after college and nothing in recent years, my own personal experience with marijuana left me convinced that it is a highly pleasurable and wonderful diversion that every adult should be free to enjoy without legal threat or repercussions. For years our government has been wasting billions of tax dollars on a bizarre propaganda scare campaign against marijuana, an enjoyable and relatively harmless drug. While smoking marijuana, like cigarettes, is not good for your lungs, an objective evaluation of the adverse health impacts of marijuana shows that pot is substantially less harmful than alcohol and tobacco – legal drugs many people enjoy whose dangers are well-established, substantial, and undeniable. Alcohol is associated with alcoholism, drunk driving, and violent behavior. And cigarette smoking is causes deadly diseases such as lung cancer, emphysema, heart disease, and stroke. While no deaths are attributed to marijuana use, alcohol consumption results in 80,000 deaths annually and tobacco smoking 440,000. My family knows from personal experience the value of medical marijuana because it was a blessing to my brother-in-law Kevin -- relieving nausea and vomiting, caused by chemotherapy, and easing both physical and emotional pain when he was dying of cancer 27 years ago. At the time, family members smoked marijuana with him, without shame, within the humane confines of a major hospital. Staff was aware but “don’t ask, don’t tell” was the compassionate unofficial policy at the time. Certainly, we would all agree that no one with a debilitating illness should be denied treatment that eases their suffering. For this reason, I hope New York will soon join the 16 states which already have medical marijuana laws. Of course, some argue that medical marijuana is a “Trojan Horse” or ruse to pave the way to full legalization. That may be true but it neither negates the real medical benefits of marijuana nor the other valid reasons for legalizing marijuana. Liberals and conservatives alike understand the concept of adults making their own choices and living their own lives. One need not be a card carrying libertarian to insist that government respect our private lives and reject an over-reaching “nanny state” where government treats adults like children, needlessly restricting their behavior and telling them how to live. Consequently, we recognize the right of adults to consume alcohol and tobacco because we live in a society founded on individual rights and free choice. We respect the right of adults to choose to use these recreational drugs despite their known risks with the caveat that they be used in a manner that does not harm others. This line of reasoning should apply to marijuana -- a drug which is less harmful than either alcohol or tobacco. The thought of legalizing marijuana raises legitimate concerns among parents who question whether legalization would make marijuana more available to kids. While precautions should be taken to prevent that from happening when marijuana is legalized (similar to current laws forbidding the sale of cigarettes and alcohol to minors), let’s be honest and admit that criminalization of marijuana has done little or nothing to keep marijuana out of the hands of youth. Ask most middle or high school students and they will tell you “it’s everywhere” and they can get it any time they want. But isn’t today’s marijuana more potent and therefore more dangerous than the marijuana of the 1960s and 1970s? This claim is debatable but even if it were true it doesn’t mean marijuana users today risk more harm. Rather it just means they have to smoke less to feel the drug’s pleasurable effects. Marijuana has been called a “gateway drug” whose use leads those who experiment with it to get hooked on really dangerous drugs like cocaine or heroin. But couldn’t we say the same thing about milk, bubblegum, and potato chips because serious drug abusers have also consumed these substances before using hard drugs. The fallacious gateway argument really falls apart when we consider alcohol since it is probably more likely than marijuana to lead susceptible people with addictive personalities to more dangerous drug use yet alcohol is legal. It is true that some people can develop psychological dependency on marijuana and it can decrease motivation. But this risk should be put into context since the same can be said of many legal behaviors when taken to extremes. People get hooked on and overdo shopping, eating, exercising, gambling, video gaming, surfing the web, texting among other activities. Moreover, both legal alcohol and tobacco are more habit-forming and addictive than marijuana. Current U.S. drug policy and laws mimic the failed and discredited prohibition of alcohol that our nation suffered through from 1920-1933. Prohibition of alcohol didn’t stop Americans from drinking but it did waste a lot of dollars and lives. Besides huge taxpayer expense, criminalizing alcohol created a black market run by violent criminals. It also turned ordinary citizens who continued to enjoy a drink into criminals. Prohibition was damaging and futile on every level. Not surprisingly, many current and former law officials, who have organized Law Enforcement Against Prohibition (www.leap.cc/cms), reject marijuana prohibition and the entire $45 billion a year “war on drugs” for the same reasons -- arguing that it is causing far more harm than good. Across the country there are countless stories of police conducting marijuana busts that have left people injured or killed and families ruined. Legalization would get the police out of this ugly business of needlessly hurting people. It would also remove marijuana users from coercive drug courts which deprive participants of their basic legal rights while threatening them with incarceration if they slip up and fail a urine test. It makes no sense to punish non-violent marijuana users at all – let alone by controlling the content of their urine or incarcerating them in dangerous places like the Erie County Holding Center yet this is what drug courts do now. Respect for police and the courts would improve immeasurably if marijuana was legalized and this unjustified persecution was stopped. Even in New York, if you are caught possessing more than an ounce of marijuana or giving or selling even small amounts to friends, you could end up with three months in jail, thousands of dollars in legal fees, and a lifelong criminal record. That’s just flat out wrong. A marijuana conviction could also result in the loss of college financial aid, your car, your house, your personal property, your job, and your children. Right now these terrible consequences could be yours for enjoying a relatively harmless herb. Commenting on California Proposition 19, Mike Memo, Communications Director for the Marijuana Policy Project (www.mpp.org), said, “The debate is out in the open, and many Americans are now for the first time in their lives thinking seriously about legalizing marijuana.” His organization and others are looking to 2012 to be a breakthrough and hope to see successful legalization campaigns in California, Colorado, and Washington. Supporting Memo’s position are the undeniable and substantial economic and taxpayer benefits of legalization. In 2005, leading economist Milton Friedman and more than 500 other American economists endorsed Harvard University economist Jeffrey Miron’s study “The Budgetary Implications of Marijuana Prohibition” which examined the costs of marijuana prohibition and the potential revenue gains from legalizing it and taxing its sale. The report stated that ending marijuana prohibition enforcement would save $7.7 billion in combined state and federal spending while taxation would yield up to $6.2 billion a year in new revenues for the federal and state governments. Legalization would also help the economy by creating tens of thousands of legal jobs for marijuana growers and sellers. Of course, there is still a lot of opposition. Legalization is opposed by most politicians because either they actually believe the lies about marijuana or they are afraid they will be accused of being “pro-drug” and weak on crime. Even President Obama, who knows better, has played it safe and kept the ineffectual war on drugs -- including marijuana -- going. While the Obama Administration has eased up on medical marijuana dispensary raids, these raids have continued albeit at a lower level. Moreover, the White House actively opposed Proposition 19, and when it lost, Obama drug policy director, Gil Kerlikowske, continued the tired, deceitful government “killer weed” scare campaign by cheering its defeat with a statement exaggerating the dangers of marijuana. Beer distributors in California as well as drug cartels in Mexico opposed legalization because they feared it would reduce their profits. While many in law enforcement support legalization, concerns about career advancement and vested economic interests mute that support. After all, court expenses are paid by marijuana offenders. And police departments justify their budgets fighting marijuana and receive even more money by seizing property during marijuana busts. The incarceration of marijuana and other non-violent drug offenders – needless, harmful, and unjust as it is -- pays prison guard salaries and ”justifies” unneeded prison space at great cost to taxpayers. Marijuana prohibition is unjust, inhumane, a waste of police, legal, and taxpayer resources, and the epitome of unwarranted big government intrusion into and interference with our private lives. Whether for medical use or pleasure and relaxation, it is only a matter of time before we come to our senses and legalize this relatively harmless drug for adults who choose to use it.